When humankind takes over the natural task of monitoring the birth and early life of shellfish, we begin to get some idea of the enormity of the ecologic cycle. We recently took the opportunity to visit a shellfish hatchery in Washington, near Seattle. We had the grand tour of the facility with the hatchery algologist. What is an algologist and why does a hatchery need one? An algologist is a scientist who specializes in algae, the primary food source of oysters. Algae is a waterborne cellular plant that combines with sunlight and carbon-dioxide to produce oxygen. A typical algae cell grows by splitting in two. Each cell is about 4 microns long. A milliliter of water can contain 5 million cells! The birthing process of oysters begins by obtaining a small vial of algae from a laboratory that can guarantee its purity. It must be free of contaminates. At one end of the hatchery, therefore, the algologist initiates the process of growing enough algae to feed the oysters. 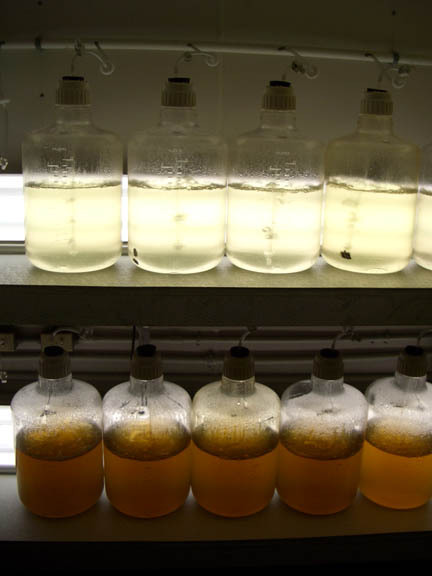 The algae is kept in a controlled laboratory-like environment with plastic bottles, pumps, and tubes that circulate the algae to ever larger containers as it subdivides and grows. The bottles are replaced by flasks, the flasks are replaced by transparent tanks, tanks the size of water heaters. These are replaced by even larger tubs, and so on. A huge quantity of water filled with algae is readied to feed the baby oysters when they arrive. In 12 to 29 days the larvae become "spat." At this stage, the spat consume huge quantities of algae and grow very rapidly. The tiny oysters have a single "foot" that they use to attach to their environment. In the hatchery that we visited the spat are then pumped into large vats where net bags of oyster shells are used to catch them. The bags are then lifted out of the vats onto trucks and transported to the waiting oyster beds. An alternative method that is often used in New England hatcheries is to introduce very small fragments of shell into the tank with the spat. The oyster spat attaches itself to the individual shell fragment. The truck method of transporting spat described above demonstrates the scale of the task as well as the hardiness of oyster spat who survive the long journey completely exposed to the open air. When hatcheries in New England use the more direct "individual" method, the hatchery raises the spat to the size of the finger nail on your little finger. Thousands of spat are then transported directly to the oyster sea farm still submersed in sea water. When they arrive, the gallons of live spat are emptied directly into waiting perforated bags and submerged [planted].